NOTE This museum DOES NOT advocate violence and we strongly support ONLY peaceful political change. HOWEVER there is also a funny bone over here. 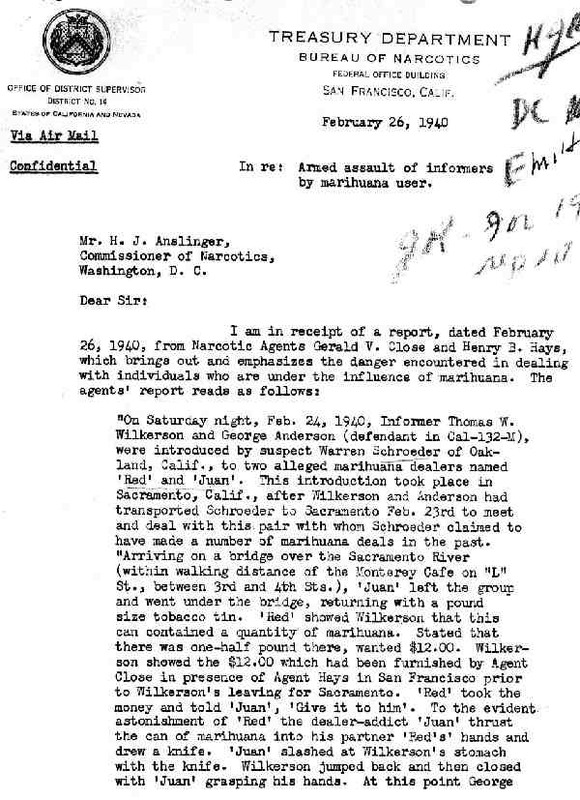 It seems that the Harry Anslinger’s narcotics police started to go nut’s over why a couple of their paid INFORMERS were accosted. Their conclusion --- Why of-course, it must have been because of the effects of Medical Cannabis, THE WEED OF MADNESS. That’s why it happened. In re: Armed assault of informers by marihuana user. "Anderson threw his arms about 'Juan' from behind to assist Wilkerson. At that stage of the fight, ‘Red’ threw the can of marihuana over the bridge into the Sacramento River and grappled with Anderson forcing Anderson to release 'Juan'. As soon as Anderson let loose of 'Juan' he struck 'Red' with his fist and knocked him into the street. Wilkerson released 'Juan' and backed away from his knife. 'Red' got to his feet and urged Wilkerson and Anderson to run from 'Juan'. At that 'Juan' yelled, 'You too you so-and-so' and rushed at his own partner with the knife, chasing him out of sight of the informers over the bridge. Both informers were cut on hands. "In support of this account, I attach affidavit of Thomas Wilkerson, supported by affidavit of George Anderson (who now knows that I am an officer and offered to assist the Government in any way he can to apprehend violators of the narcotic laws), Form 129 for $12.00 advance funds furnished by Agent Close to T. W. Wilkerson. 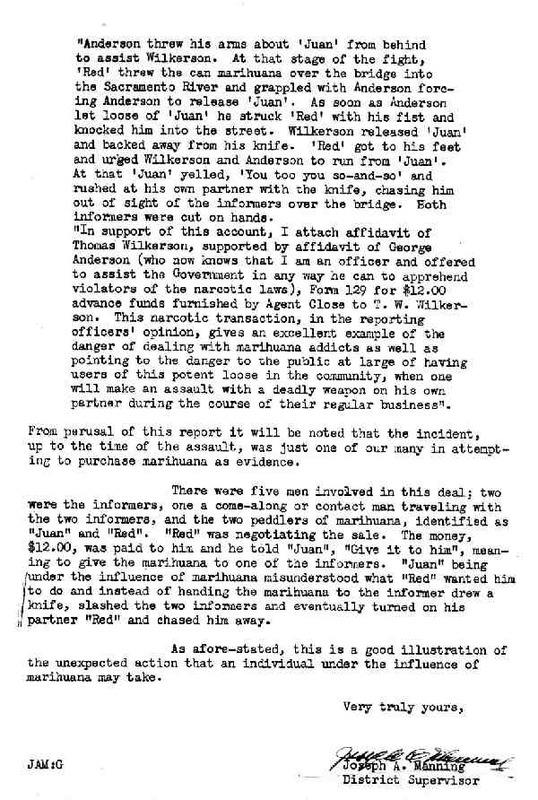 This narcotic transaction, in the reporting officers' opinion, gives an excellent example of the danger of dealing with marihuana addicts as well as pointing to the danger to the public at large of having users of this potent loose in the community, when one will make an assault with a deadly weapon on his own partner during the course of their regular business". From perusal of this report it will be noted that the incident, up to the time of the assault, was just one of our many in attempting to purchase marihuana as evidence. There were five men involved in this deal; two were the informers, one a come-along or contact man traveling with the two informers, and the two peddlers of marihuana, identified as “Juan" and "Red". "Red" was negotiating the sale. The money, $12.00, was paid to him and he told "Juan", "Give it to him", meaning to give the marihuana to one of the informers. "Juan" being under the influence of marihuana misunderstood what "Red" wanted him to do and instead of handing the marihuana to the informer drew a knife, slashed the two informers and eventually turned on his partner "Red" and chased him away. As afore-stated, this is a good illustration of the unexpected action that an individual under the influence of marihuana may take.